Featuring small-town stampers who are sure to leave their mark. A professional rubber stamper who creates intricate patterns on walls, April Buchert is back home in Aldenville, Pennsylvania, helping her father restore the famous Winchester mansion. But when a human skull tumbles out of the rubble, all eyes are on April’s father, who oversaw the construction twenty years ago. As unexplained deaths pile up and a dangerously handsome carpenter becomes a pleasant distraction, can April chip away at the truth before another innocent victim is stamped out? A decent mystery that doesn't involve a current body - rather, it involves a discovered skull that's years old, and the book waits to discover this until after page 45. The story is focused heavily on the protagonist's life and struggles, as well as the small town residents. It's entangled especially with her father, who left them when she was younger because he was gay, and his struggling business. There's also the side-story involving her mother, a woman who never quite let go of the past. The nursing home story was a little confusing and seemed to be thrown in either as a wrench to the reader guessing what's going on, or else the author was originally going to do something else with that storyline and then changed her mind. The ending offers a convenient wrap-up, with the murderer but also with a personal problem involving a job renovation. As far as mysteries go, it's semi-decent but it's hard to feel invested. I couldn't care about the victim since I never met them, they weren't introduced until much later in the story, and the motives were all old ones that didn't become clear till the end. Hard to care much about it, other than the worrying about the protagonist's father being unreasonably indicated. Still, it's clear he would never have charges stick long since there was no evidence at all, only suspicion from a paranoid cop. While the mystery part wasn't strong, it was intriguing how the author put so much controversy in the personal lives of the characters. As a series, this would hold promise for future installments. The writing style is well-done and focused, characterization realistic enough, but there's not much warmth here other than some brief insights into April's life. The set-up with the love interest is rather obvious from the start, and I didn't care much about what happened with it. The townsfolk are okay - the parents are not typical, so that's a refreshing change. It was funny how everyone kept treating her differently since she had previously been living in San Francisco. She even compared it to being compared to a Martian. I also liked the author's ballsy move to throw in the husband woes - she left a bad marriage with a gambler, not something touched upon enough for this kind of story. They usually get something more direct and clean, here it was realistic without being melodramatic or wishy-washy. 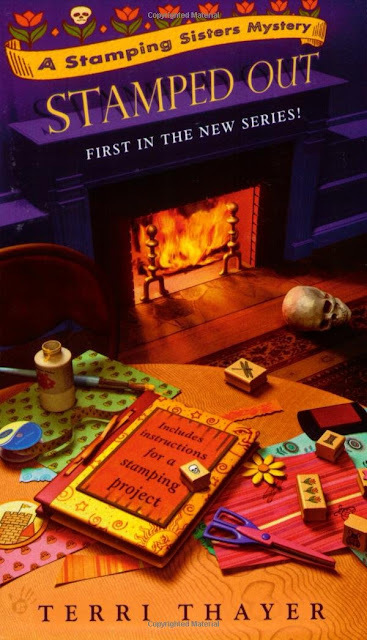 Nothing original really - and stamping isn't my idea of fun for a cozy theme - but it was not a bad book. The sequels will probably be better now that the introductions are out of the way.